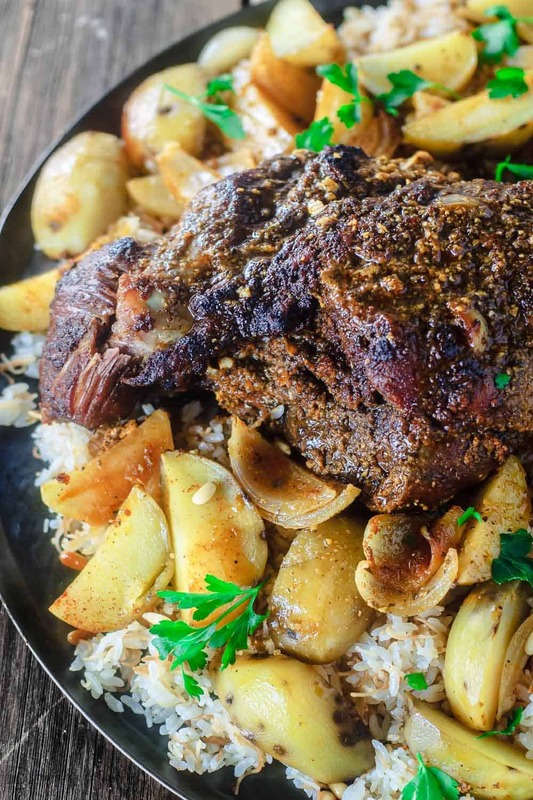 The ultimate Mediterranean-style leg of lamb recipe! 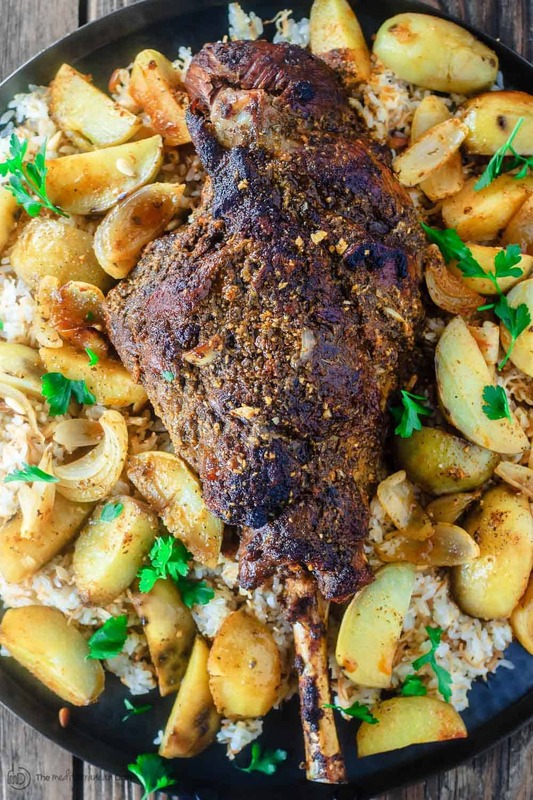 Leg of lamb covered in a rub of fresh garlic, Mediterranean spices, olive oil and lemon juice. Roasted with potato wedges and onions. Even better over a bed of Lebanese rice! This foolproof recipe comes with my tips, video, and step-by-step tutorial for how to cook leg of lamb. Although we don’t eat a ton of red meat, where I come from, leg of lamb might as well be the official regional meat. It makes an appearance at big suppers, family gatherings, Christmas, Easter, and every occasion in between. My mother-in-law, a master of the Levant kitchen, makes the best leg of lamb. But since we moved away a few years ago, it’s been up to me to provide the “celebratory” lamb roast. And after some (a lot of) experimenting, I have come to this leg of lamb recipe that is now my family’s holiday roast. For best results, purchase high-quality bone-in leg of lamb. And while you’re at it, ask the butcher to trim the fat off. Leg of lamb is already quite tender, there is no need to marinate it for a long period of time. In fact, in this recipe, I do not marinate the leg of lamb at all. But, I do coat the leg of lamb with a generous rub of garlic, Mediterranean spices, olive oil and lemon juice. Do everything you can to avoid over-cooking it. My family likes leg of lamb cooked to a perfect medium (internal temperature 140 degrees F); but in my opinion, it is even better medium rare (internal temperature 130 degrees F). Remember, because this is a big hunk of meat, there will be some variability– some parts will be more pink than others, for example. 1. To make this leg of lamb recipe, first thing you need to do is take the lamb out of the fridge for about 1 hour before cooking. 2. The key to all the flavor here is the wet rub that goes all over the lamb. This is best done in a food processor. Combine the garlic cloves, oregano, mint, paprika, nutmeg, olive oil and lemon juice. Blend until smooth. Set aside (or in the fridge, if making ahead). 4. Reduce oven heat, and tent a piece of foil over the lamb and potatoes (you don’t want the foil too tight). Roast for 1 hour, then remove the foil and roast a few more minutes until we reach desired doneness. For a medium-ish leg of lamb, I stop when internal temperature registers 140 degrees F or so. Pro tip: you can go longer if you like, but remember you do need to let the leg of lamb rest before serving, so it will continue to cook through as it’s resting yet. 5- As mentioned, once removed from the oven, let the leg of lamb rest about 15 to 20 minutes before serving. This allows juices to redistribute. 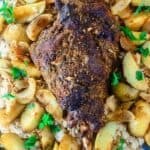 How to Serve leg of lamb The Mediterranean Way? True to the Mediterranean lifestyle, this leg of lamb recipe is meant to be shared with family and friends. It is traditionally served family-style on one large platter with the roasted potatoes and Lebanese rice. If you have some extra pan gravy, be sure to drizzle on top! What else is good to serve along? Try Roasted Red Pepper Hummus or Baba Ganoush for starters; and Tabouli, Fattoush; or this chickpea salad with eggplant for a side salad. And of course, some warm pita bread! 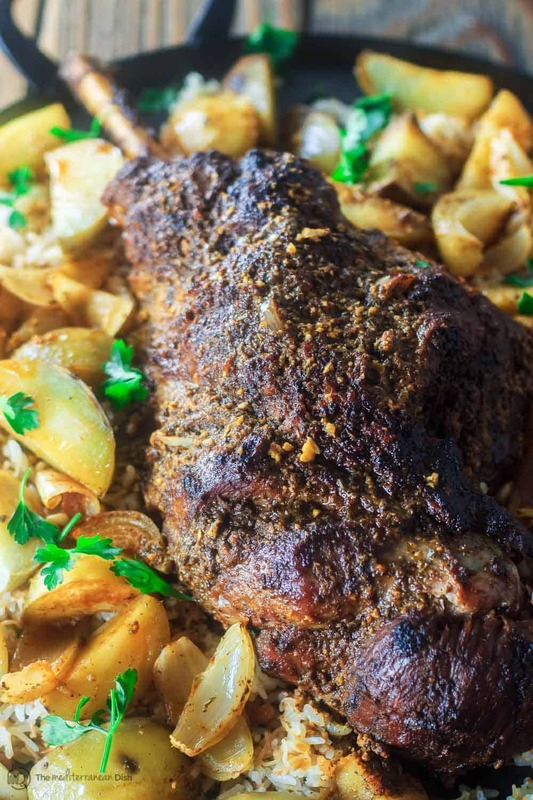 Flavor-packed Mediterranean leg of lamb recipe with potatoes! Be sure to watch the video and review the step-by-step and tips above. Take the leg of lamb out of the refrigerator and leave in room temperature for about 1 hour. In the meantime, prepare the remaining ingredients and make the lamb rub. 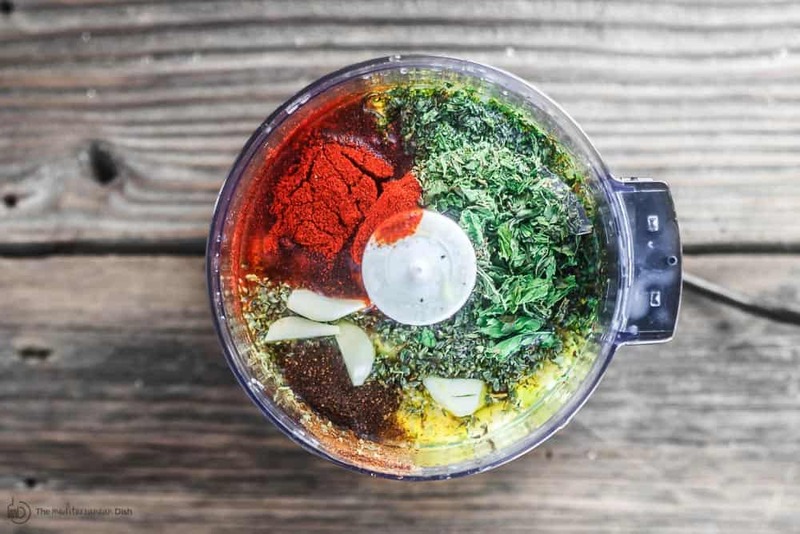 To make the rub, in a food processor, combine the rub ingredients. Blend until smooth. Set aside (or in the fridge, if preparing in advance). When ready, pat the lamb dry and make a few slits on both sides. Season with salt and pepper. Turn the oven on broil. Place the leg of lamb on a wire rack; place the rack directly on the top oven rack so that it’s only a few inches away from the broiler element. Broil for 5-7 minutes on each side or until the leg of lamb is nicely seared. 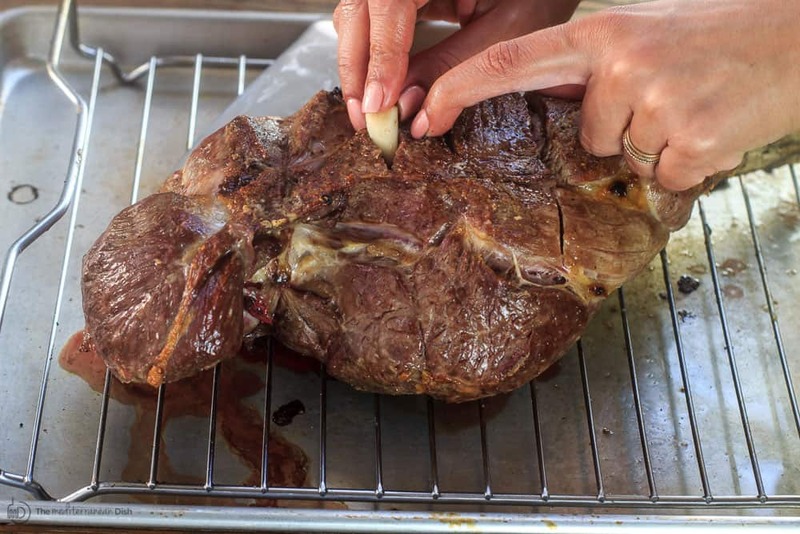 Remove from the oven, then adjust the oven temperature to 375 degrees F.
When the lamb is cool enough to handle, insert the garlic slices in the slits you made earlier. Now cover the leg of lamb on all sides with the wet rub you made earlier and place it in the middle of a roasting pan with an inside rack. Add two cups of water to the bottom of the roasting pan. Season the potato and onion wedges with the paprika, garlic powder and a little salt, then add them to the pan on either side of the lamb. Now tent a large piece of foil over the roasting pan, then place the pan on the middle rack of the 375 degrees F heated-oven. Roast covered for 1 hour. 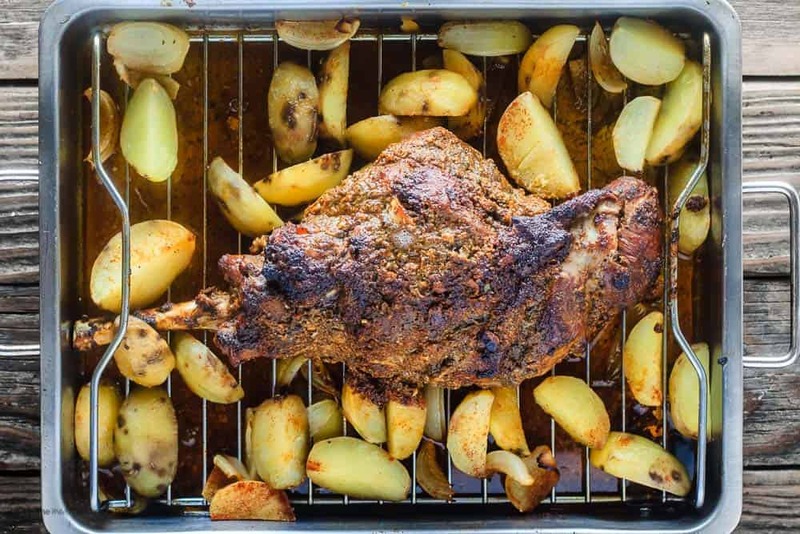 Remove the foil and return the roasting pan to the oven for another 10-15 minutes or until the lamb temperature registers 140 degrees F for medium. Remove the pan from the oven and let the leg of lamb rest for at least 20 minutes before serving. If you choose to, midway through roasting the lamb, cook the rice according to this recipe. 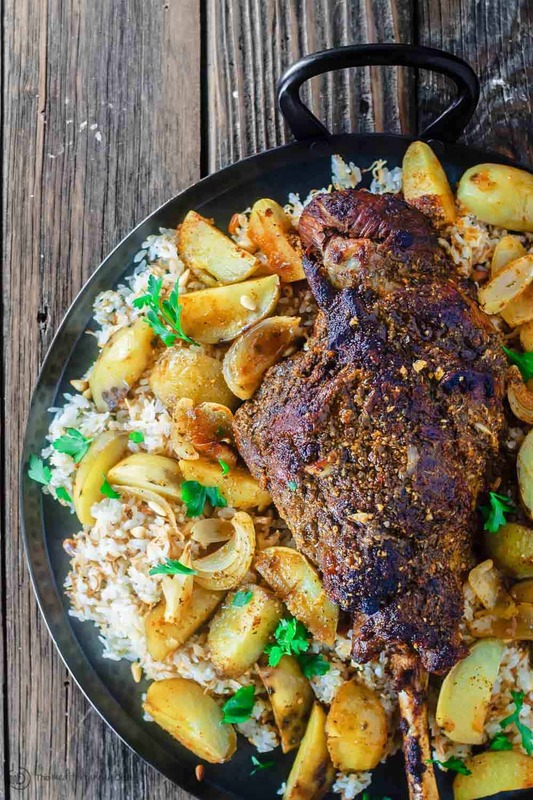 Place the lamb and potatoes in a large serving platter over a bed of Lebanese rice, if you choose to. Garnish with parsley. Or, you may carve the lamb first, then arrange the sliced lamb with the potatoes over the rice. Enjoy! Pro Tip: When you purchase your leg of lamb ask the butcher to trim the fat. Pro Tip: Do everything you can to avoid over-cooking it. My family likes leg of lamb cooked to a perfect medium (internal temperature 140 degrees F); but in my opinion, it is even better medium rare (internal temperature 130 degrees F). Remember, because this is a big hunk of meat, there will be some variability– some parts will be more pink than others, for example. Used in this recipe: Private Reserve Greek extra virgin olive oil (from organically grown and processed Koroneiki olives.) And from our all-natural spice collection: paprika and nutmeg. 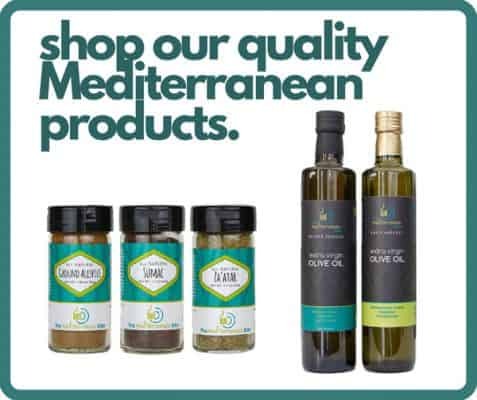 Visit our online store for your cooking needs! My mother (Italian) started about 40 yr ago making a version of this here in US which seems probably Americanized. Not so many herbs and spices, no pre- broiling, no rack. She simply used salt & pepper, garlic and onion. The potatoes are sliced about 3/16 ” thick and mixed with an abundance of equal thickness onions in a giant bowl where they are seasoned with s&p and tossed. The leg of lamb is seasoned and placed directly in roasting pan then potat’s mixture added to almost fill pan. add a bit of water to pan for moisture and cover with foil. I roast at 325 until almost done, stirring potat’s occasionally. Uncover the last 45 or so minutes to brown everything, still stirring. 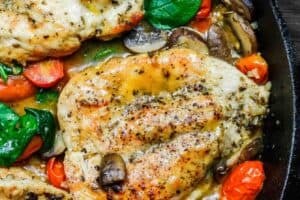 My first time writing about cooking! Sheesh … 72 yo man! Hi! Was searching for a leg of lamb recipe to make for Christmas Eve (we’re Armenian so it must impress!) and came across this recipe. Looks like a great one that may do the trick. 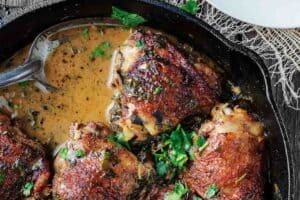 How long to you typically leave the leg under the broiler prior to baking? Also – I’m expecting 11 people – would you recommend a 10-11 lb bone-in leg and doubling the rest of the recipe? Thank you in advance! Hi Alexa! To answer your question, we first season the lamb leg with salt and pepper then broil for 5 to 7 minutes before we continue on with the rest. See step #4 in the recipe for that. If you go with a large lamb leg, the recipe is forgiving enough that you can simply double the ingredients for the wet rub etc. Enjoy. I have an 8 pound leg how long should I cook it to be well done at this temperature? 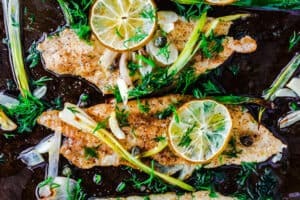 Love this recipe by the way and thank you for sharing it. Ibrahim, it really depends on your oven somewhat. It’s best to use a meat thermometer to be sure. An internal temperature of 145°F means that the meat will be at a medium-well doneness. If you want to go for really well done, look for temperature at 155 F.
Kathleen, I am so so glad to hear this! Thank you for sharing! Hey! Can you do this recipe with a bonless lamb shoulder? Sure, Shahira. The cooking time will vary, though. You may like to cook the potatoes a bit first before adding the boneless lamb. The crust in the recipe was delicious. The lamb was so flavourful. I loved it, will make again. 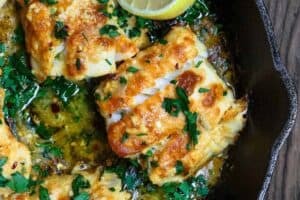 recipes each week and we love them all. For years now Lamb has always been our main course for Easter dinner and I’ll be preparing your Leg of Lamb w/potatoes this year. I’m also including several other recipes from your Easter group to complete our dinner. You’ve included so many I’m having trouble choosing but, will eventually be making all of them in the next few weeks. Thank you for these delicious recipes. Please keep them coming. Cynthia, your kind comment made my day! I am so humbled. And I am so so happy to know that I can be a little part of your journey in eating the Mediterranean way. All the best! And Happy Easter! i have an 11 pound leg of lamb. would you recommend doubling the recipe? and how long to broil and cook then? Hi Melissa. So for the rub etc, yes you can double the recipe and use the amount you need of it. As far as how long to cook it, if you’re looking for medium, you’ll want your meat thermometer to read between 135°F to 140°F, it’ll be about 20 minutes or so per pound). Hope this helps. Wonderful, Sarah! I am so so glad you enjoyed it! Can i use a boneless leg? Yes, I believe so! You might need to adjust the cooking temp and time for a boneless leg. 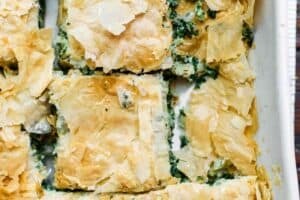 I meant to comment earlier but I prepared this recipe for my family in May for Greek Orthodox Easter and they raved about it. My mother said it was the best lamb I had ever made. Thanks for the great recipe! Margaret, thank you so much for taking the time to share! I am glad you gave this recipe a try. And that it was actually your Easter meal!!! Thank you. Hope you find more to try here! This looks so incredibly tasty and doable! Thank you, Ameshnee! I am glad you said “doable,” because this recipe definitely is! And I can’t wait to hear how it works for you. My mouth is already watering. I love the spices, and beautiful vegetables you cooked the lamb with! Beautiful photography! Thank you so much, Maria! It’s a favorite at our house. 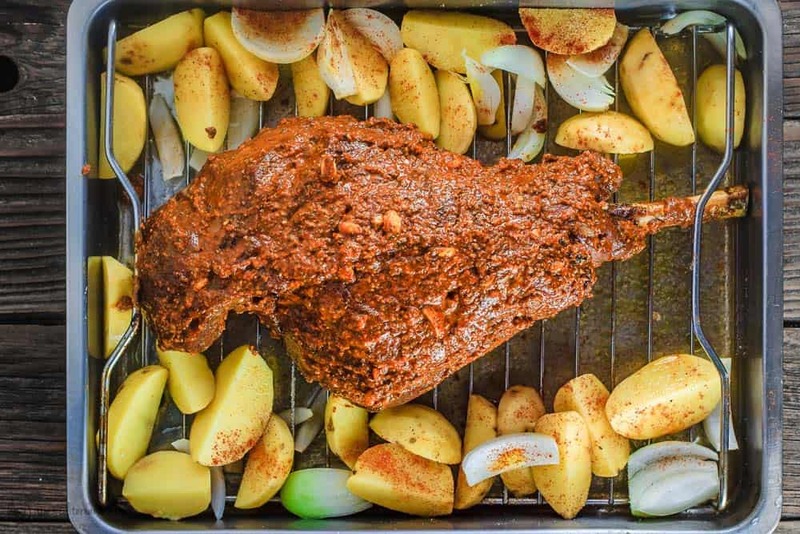 This has convinced me that I need to try leg of lamb–looks great! I am so making this! We’re staying home on Sunday instead of visiting with family so I have been procrastinating about the menu. Now I know what to make, since I know you won’t steer me wrong when it comes to great lamb! Wow, I can almost smell it now… mmm. Hope you enjoyed it, Katie!